Southeast Alaska has more than 10,000 estuaries that flow into the bays, fjords, and channels, then coalesce to form a single overarching estuary system. For communities in the Panhandle, this literally amounts to a fish factory—one of the greatest on earth—producing over a billion dollars worth of commercial fish alone for world consumption every year. We call this remarkable ecological and economic system SeaBank. SeaBank will organize, explain, and present information illustrating the vast economic value of this natural wealth- making policy and personal decisions that ensure its future productivity a no brainer. Fishing is the economic life-blood of Alaska. 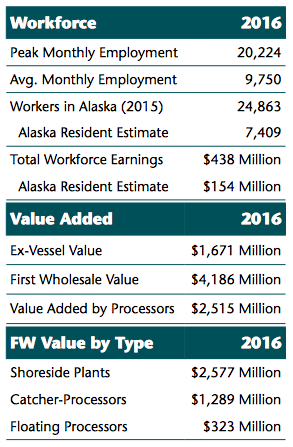 Alaska is the top seafood producer in the U.S. and it's seafood industry employs roughly 60,000 people (ASMI). Alaska Seafood Marketing Institute (ASMI) is a marketing organization that has gathered extensive data concerning the economic importance of Alaskan fisheries to Alaska's economy, the United States, and the rest of the world. In Alaska, salmon nets the largest ex-vessel value of all Alaskan species, but pollock has the highest harvest volume of all Alaskan species. "ASMI contracted with McDowell Group to update the economic impact of Alaska’s commercial seafood industry. The analysis quantifies the regional, statewide, and national economic impacts of Alaska’s seafood industry. This report summarizes overall industry participation, value, and exports. It also highlights the significant impact the industry has on tax revenues, investment and charitable giving by the industry, and the value of industry assets." Click here to read the full report by ASMI and the McDowell Group. Southeast Alaska’s economy is highly dependent on the region’s rich natural resources. SalmonState contracted with McDowell Group, an Alaska-based research and consulting firm, to measure the economic impacts in Southeast Alaska of three transboundary watersheds: Taku, Stikine, and Unuk Rivers. "Abrupt shifts in natural resources and their markets are a ubiquitous challenge to human communities. Building resilient social-ecological systems requires approaches that are robust to uncertainty and to regime shifts. Harvesting diverse portfolios of natural resources and adapting portfolios in response to change could stabilize economies reliant on natural resources and their markets, both of which are prone to unpredictable shifts. Here we use fisheries catch and revenue data from Alaskan fishing communities over 34 years to test whether diversification and turnover in the composition of fishing opportunities increased economic stability during major ocean and market regime shifts in 1989. More than 85% of communities show reduced fishing revenues following these regime shifts. However, communities with the highest portfolio diversity and those that could opportunistically shift the composition of resources they harvest, experienced negligible or even positive changes in revenue. Maintaining diversity in economic opportunities and enabling turnover facilitates sustainability of communities reliant on renewable resources facing uncertain futures."